After you publish your landing page, you may want to monitor on the number of unique visits and new signups. Our Track with Mailchimp feature collects this information for you and adds it to your landing page report. In this article, you’ll learn how to use Track with Mailchimp to gather data about landing page visits and signups. Make sure you’re familiar with Landing Pages in Mailchimp. Depending on what laws are applicable to your business, you may be required to notify your page visitors about tracking and allow them to opt out. If necessary, we recommend you add a notification bar that includes an opt-out link. You can update tracking on both draft, published, and unpublished landing pages. You’ll need to choose your tracking settings for each new landing page you create. Our Track with Mailchimp feature counts the number of unique visitors to your landing page and adds this data to your campaign report. If your page includes a signup form content block, you’ll also see how many page visitors subscribed to your list, which we refer to as conversions. To turn on Track with Mailchimp in your landing page campaign, follow these steps. Navigate to the Campaigns page in your account. Click the name of the landing page you want to work with. If your landing page is already published, click the drop-down menu and choose Edit and skip to step 4. In the editor, design your content and click Save and Continue. Scroll to the Settings & Tracking section and click Edit. Click Accept to confirm you agree to our additional terms. You’ll only need to accept the terms once. 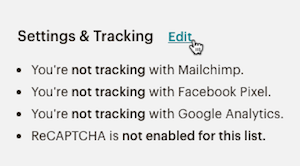 Click the box next to Track with Mailchimp. All set! As soon as you publish, we'll start gathering data as people visit and interact with your page on the web. 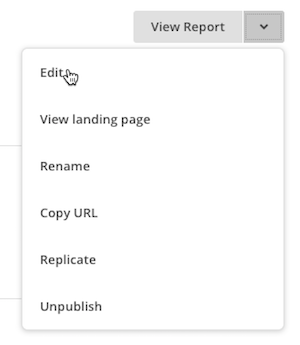 You can view Track with Mailchimp data in landing page reports. Here are some other ways you can track visits and to landing pages. Facebook Pixel With the Facebook Pixel, you can gather data to build Facebook ads more likely to retarget and convert people who view your landing page. To learn how to set it up, check out our article about how to use Facebook Pixel on your landing page. Google Analytics Use Google Analytics on your landing page to better understand your visitors with more detailed analytics. You’ll need a Google Analytics account to get started. To learn more, check out our article about how to use Google Analytics on your landing page. Use Facebook Pixel to track people who visit your landing page and then show them Facebook ads. This is a great way to remind landing page visitors of your brand, and helps make sure your Facebook ads are shown to the most relevant people. Learn how to add Google Analytics tracking to your landing page.